1. Eat! You can eat as much real, healthy food as you want. Yes you heard that right – chow down folks, without any guilt. All sugar, including honey, maple syrup etc. No bacon either – did you know almost all bacon has sugar!! Oh, and no chocolate (not even dark), which, except for the last bullet point is absolutely the hardest part for me. Grains: NBD. This one doesn’t really bother me to much. Legumes: Fine, fine. I don’t agree with this 100% (see this post for my stance on legumes), but I will do it for 30 days. And yes, not even peas. Dairy: Yep, this means no cheese…. which I try not to eat anyway, but we all know how that goes. Today’s recipe is Whole 30 compliant, easy, cheap and delicious. Since this week was Mardi Gras, I thought this one was fitting! 1. For the Gumbo, chop the onion and garlic and slice the chicken thighs into 1 inch pieces, set aside. 2. Heat the butter/ghee over medium-high heat and add the onion and garlic. Cook, stirring occasionally, until softened and translucent (about 5 minutes). Once cooked, add to the slow cooker. 3. Return the pan to the stove and allow to return to medium-high heat. Add the chopped chicken and cook, stirring occasionally until browned. Once cooked, add to the slow cooker. 4. Slice the chicken sausage into bite sized pieces and add to the slow cooker. 5. Peel and chop the carrots and add to the slow cooker. 6. Chop the remaining veggies (celery, bell pepper and parsley) and add to the slow cooker. If you are feeling fancy, reserve just a bit of the chopped parsley for garnish later. 7. Top with the spices (red pepper, oregano, salt and pepper), tomatoes and chicken broth. Stir gently and let cook on low for 4 hours. 8. After 4 hours, ladle out as much of the gumbo broth from the pot as you can into a large pot. Bring to a simmer and let reduce for 15-20 minutes. 9. Meanwhile, for the “Rice”, “rice” the cauliflower by pulsing in a food processor. It you have never done this before you might want to check out this Everyday Maven page for the play by play. Once the cauliflower has been “riced” add to a rice cooker along with the butter/ghee, salt and chicken broth. Cook for about 10 minutes or until tender (stir one time once the butter has melted). Note: If you don’t have a rice cooker you can also just throw the ingredients in a medium size pot over the stove and cook until the cauliflower is tender. The rice cooker just seems easier to me. 10. Make an arrowroot “slurry” by stirring together the arrowroot and water until the powder is dissolved. Remove the gumbo broth from the heat and stir in the slurry to thicken. 11. Return the thickened gumbo broth to the slow cooker and stir all ingredients together. 12. To serve, scoop a serving of rice into a bowl and cover with a couple of ladles of the gumbo. Garnish with reserved parsley and add a couple of shakes of hot sauce if you are into that sort of thing. P.S. I had intended to add some frozen okra in the recipe, but it is still sitting in my freezer and I didn’t really miss it. If you feel so inclined, throw some in the slow cooker during the last 20 minutes. It should still slide in under the $5 per serving limit even with this add. 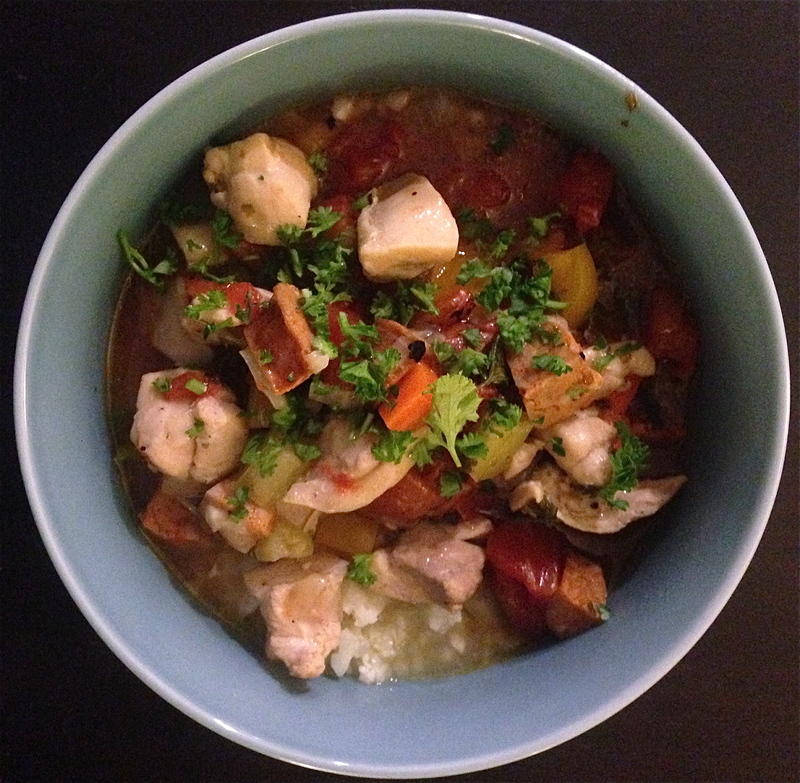 Tags: 30 - 45 minutes, Chicken, Gluten Free, Paleo, Under $5 / serving, Whole 30. Bookmark the permalink.